Jake Peterson's Blog » Ghost Forests are the Best! Ghost Forests are the Best! Ghost forests are a pretty amazing natural phenomenon that can yield some gorgeous images. The stark beauty of the dead trees still standing compared to the living world around them always tell an interesting story of what was and what still is. One of the best examples in Montana are the trees still standing in Earthquake Lake. More commonly known as Quake Lake, Earthquake Lake was formed after a 7.3 magnitude earthquake struck on August 17, 1959. The earthquake caused 18 miles of surface faulting and was felt across 600,000 square miles. The most noticeable damage was done below Hebgen Dam in what was known as Madison River Canyon. Water went surging over the spillway, flooding private cabins, Forest service campsites and makeshift campsites. Along with the water an 80 million ton landslide beneath Rock Creek Campground blocked the river which caused the formation of the lake. Due to the seriousness of the people trapped under the rock and water, one of the largest mobilizations of US Army Corps of Engineers in the western US was launched to create a new spillway for the water to flow out. The Madison River was forever changed and Quake Lake was born. Sadly 28 people were killed, 19 still buried under the landslide. 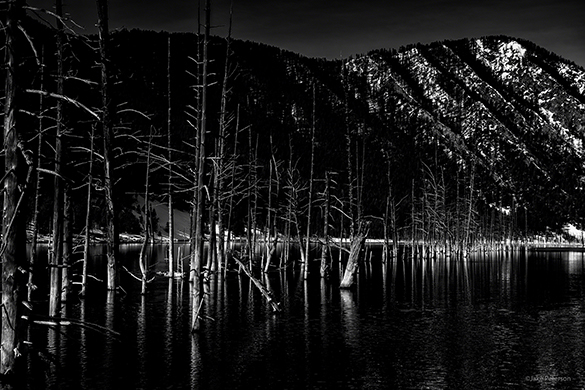 The ghost forest around the edges of the lake are a haunting reminder of the area.